← GRAÇAS… Uma palavra, expressa em centenas de palavras Em Cem Dias. Life Secrets Are Locked Inside Thanksgiving. Thanksgiving Is The Force That Set God On Motion For Your Sake. It’s Activate God’s Power, Purpose And Goodness Towards You. Thanksgiving Is Simply Doing What God Cannot Do For Himself, So He Can Do What You Cannot Do For Yourself. In The School Of Continuation, Recognition Is The Key. Thanksgiving Is Recognizing God’s Goodness In Order To Provoke More Of His Kindness. In Order To Get God’s Attention Thanksgiving Is The Requirement. 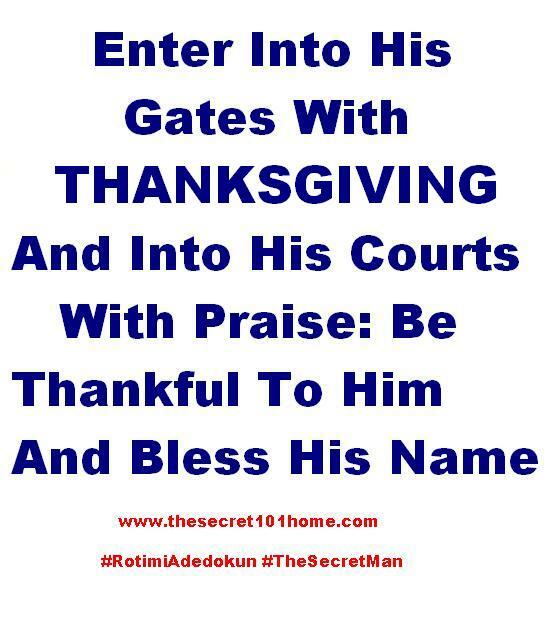 Remember, Enter Into His Gates With Thanksgiving And Into His Courts With Praise: Be Thankful To Him And Bless His Name. This entry was posted in Love, Self Development, The Peace, The Secret, Vitamin Of The Mind, You! and tagged Appreciation, Bishop David Oyedepo, Give Thanks, Gratitude, Thanksgiving, The Cost Of Ingratitude, The School Of Continuation. Bookmark the permalink.